According to the official Arduino site, it isn’t currently possible to use the Arduino Uno as an ISP. Having investigated this a bit, it seems that the problem is because the Optiboot loader resets the ATMega328 when the serial port is opened. When avrdude is started up to program the slave chip it firsts opens the serial port then tries immediately to write to it. The initial comms fail because the chip has reset and, whilst in the bootloader, isn’t actually responding to the STK500 protocol. This was a bit annoying, having recently bought an Arduino Uno, as I’d like to use it to program another ATMega328, and I’m too cheap to buy an FTDI cable unless I really have to. I’m also new to this game, so hacking this sort of thing is officially considered “fun”. There are reports that you can cut the reset-en link or use a 120Ω resistor to hold the reset pin high to get it to work, but I didn’t really want to cut the link. Using the resistor, as well as sounding a bit temperamental, turned out not to work for me anyway. I put the new chip on the breadboard, and connected up following the official instructions. That much is pretty easy, as is uploading the ArduinoISP sketch. Powering up I then had the LED on the Uno flashing – which I realised was because I’d previously uploaded the blink sketch to the new chip (came with the Duemilanove bootloader, I was trying to upgrade), and digital pin 13 is also the SCK pin used in programming, so the slave ship was blinking the Uno! At least I knew both chips were functioning. Apart from lots of useful information, this came up with exactly the same errors as above. It would, of course, as that’s all the IDE is calling anyway. I didn’t feel like hacking the source code for avrdude, but wondered if a delay after opening the serial port would suffice. This led to the thought that maybe if avrdude was run inside a debugger, a breakpoint could be created to stop execution at the right place. Enter gdb. That looks sane – the first thing avrdude is doing is reading its configuration file. Let’s keep going. User configuration file is "/home/matthew/.avrduderc"
Yes – the Arduino reset. Now that’s over with we might as well get rid of the breakpoint, let it run, and see what happens. Does it work? 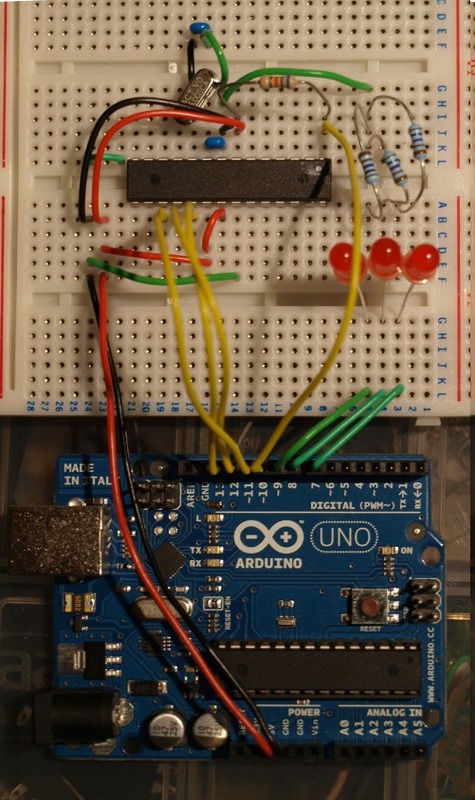 Swapping out the ATMega328 on the Uno for the newly programmed chip, setting board type now to ‘Arduino Uno’ rather than ‘Arduino Duemilanove or Nano w/ ATmega328’, and upload blink. We have a flashing LED! This was all done in Linux. I guess it should be possible to use gdb or another debugger in a similar way in other operating systems, but I have no intention of trying it. Very useful! I don’t really know why we must put a delay in open call, I should check the protocol and the isp source code. I’m writing a simple wrapper around open with a 2 seconds delay in a dynamic library an using LD_PRELOAD to load this symbol. but can you please tell me how to enter gdb or the command promte ?? Incredibly useful, even nowadays. Thank you.